Although I appreciate I should be getting On the Moor out there first, I’ve recently been ruminating on the theme of my next book. True to style, I have a number of vague, interweaving ideas in mind. Nothing concrete yet, but, believe me, I’m working in it. As long as the temperature of our planet differs from that of space so long will the forms upon her surface undergo mutation, and as soon as equilibrium has been established we shall have, not peace, but death. Life is the product and accompaniment of change, and the self-same power that tears the flanks of the hills to pieces is the mainspring of the animal and vegetable worlds. Still, there is something chilling, if not humiliating, in the contemplation of the irresistible and remorseless character of those infinitesimal forces whose summation through the ages pulls down even the Matterhorn. Hacked and hurt by time, the aspect of the mountain from its higher crags saddened me. Hitherto the impression it had made was that of savage strength, but here we had inexorable decay. —John Tyndall. ‘Old Alpine Jottings’ in New Fragments (1892). I’m pretty sure I would have liked Tyndall, had I ever met him. Scientists have discovered some of the genetic changes behind the useless wings of Galápagos cormorants. A fascinating article about how and why English is so odd. On his bicentenary, how Thoreau was reinvigorated by Darwin. An analysis of some important recent anthropological discoveries. Our species is wreaking terrible damage on our planet, but easy with the mass-extinction hyperbole. How an eccentric sense of playfulness runs through W.G. Sebald’s four major books. It was quite a surprise to turn to the Guardian’s Country Diary feature to find it had been written by someone I’ve known since I was 11. Jeremy Dagley on yellow rattle: a parasitic plant that grows in abundance in my farmer friend’s top meadow. This moving London Review of Books Diary piece by Inigo Thomas about the death of his father. This NASA video celebrating 20 years of continuous Mars exploration. You might like to check out my recent article entitled Orion’s belt-buckle about the star I ‘adopted’ in my early teens. Millie the borrowed dog is with us for a couple more weeks. She is doing well, despite the perverse enjoyment she seems to derive from walks in the rain. 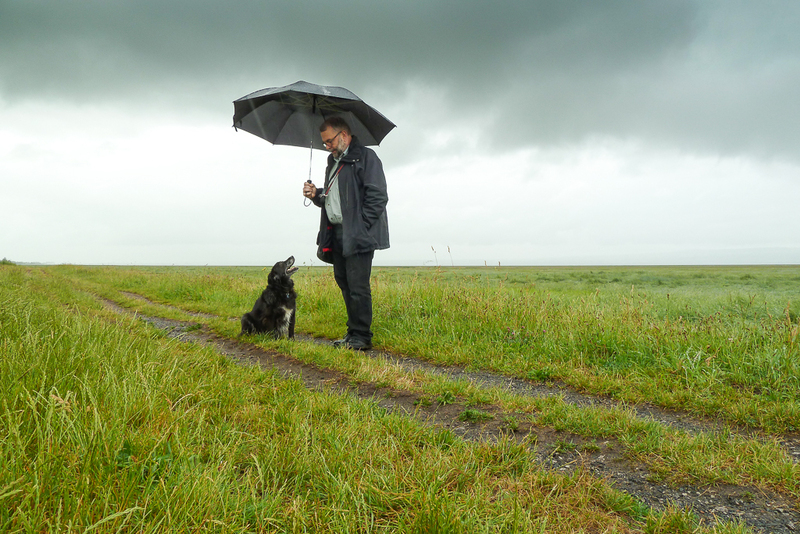 Now remind me… Which one of us ABSOLUTELY INSISTED on going for a walk, and which one of us thought to bring an umbrella? Feel free to contact me with any feedback. And please forward this newsletter to any friends you think might enjoy it, suggesting in the politest possible terms that they really ought to subscribe for themselves.